(Nanowerk News) A surprising MIT laboratory finding about the behavior of a thin sheet of material — less than a thousandth of the thickness of a human hair — could lead to improved ways of studying the behavior of electrodes and perhaps ultimately to improvements in the rate of power production from one type of fuel cell, according to a report published this week ("Catalytic Activity Enhancement for Oxygen Reduction on Epitaxial Perovskite Thin Films for Solid-Oxide Fuel Cells"). In many cases, thin layers of a material — which may be just a few molecules in thickness —exhibit properties different from solid blocks of the same material. But even though this is a known phenomenon, the nature of the difference the MIT team found in the behavior of thin films of a mineral called perovskite — in this case, deposited as a thin layer on the surface of a crystal of zirconia — "was very much unexpected," says Yang Shao-Horn, associate professor of mechanical engineering and materials science and engineering at MIT, who led the research. The work was done in collaboration with Hans Christen and Michael Biegalski at Oak Ridge National Laboratory. In fuel cells, a fuel such as hydrogen or methanol reacts in the presence of a catalyst, releasing its energy chemically rather than being burned. As a result, they can produce electricity from fuel without releasing greenhouse gases or other pollutants, and so are considered a promising alternative approach for generating electricity. And unlike batteries, which need to be recharged in a time-consuming process, a fuel cell can be refueled quickly. The main barrier to achieving greater efficiency in fuel cells, which are considered a promising way of supplying electricity for future transportation or stationary power systems, is the slow rate of oxygen production from the cathode, one of the two electrical terminals in the device. In present fuel cells, the rate of oxygen production is the limiting factor in the power output of the device. Many teams are pursuing ways of improving the efficiency and reducing the costs of the two major kinds of fuel cells: solid-oxide fuel cells (SOFCs) and proton-exchange membrane fuel cells (PEMFCs). This work addresses potential improvements in the cathode in SOFCs, which could find application in large-scale systems such as electric power plants. The new research suggests that this activity can be increased by up to a hundredfold by using thin films of certain perovskite compounds. Previous research had found the opposite, that thin films of some perovskite materials were a hundred times less reactive than the bulk material, Shao-Horn says. The new results are published online in the German journal Angewandte Chemie; the lead authors are former student Gerardo la O' and postdoctoral researcher Sung-Jin Ahn. The work was supported by the NSF, the U.S. Department of Energy, Oak Ridge National Laboratory and the King Abdullah University of Science and Technology. By creating the kind of high-purity thin films of material used in this study — in this case, as thin as 20 nanometers, or billionths of a meter — it is possible to study the details of how the surface of the material reacts in much greater detail than has been possible in research with bulk materials. This research shows that unique thin-film characteristics can enhance catalytic activity. "To our knowledge, this is the first time these thin films have been shown to exhibit" the increased activity, Shao-Horn says. The team is continuing research to verify their hypothesis about the reasons for the increased activity, and to explore a family of materials that may exhibit similar properties. "We are working on determining why" the activity level is so high, Shao-Horn says, suggesting that the increased reactivity of the material may result from a stretching of the surface. 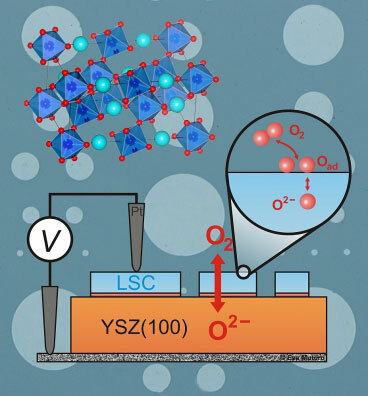 This may change the content of oxygen vacancies or the electronic structure of the material, possibilities that are being examined in Shao-Horn's group. While many fuel cells use electrodes made from precious metals such as platinum, the electrodes in this experiment are made from relatively abundant materials such as cobalt, lanthanum and strontium, Shao-Horn says, so they should be relatively inexpensive to produce. In addition, this material works at much lower temperatures than existing SOFC electrodes, which could be an advantage because "at lower temperatures, material degradation can be much reduced," she says. Whereas current cells work at temperatures of 800 degrees Celsius or higher, the new approach might lead to materials that could work at 500 degrees Celsius, as was the case in these tests. This work is just the first step, however. Shao-Horn stresses that this is the beginning of a new fundamental research area, and could lead to exploration of a whole family of possible compounds in search of one with an optimal combination of high catalytic activity and high stability. This highly reactive material could find a home in places other than fuel cells: for instance, in high-temperature sensors and in membranes used to separate oxygen from nitrogen and other gases, she says.